I am so so so sorry I’ve been MIA this weekend. I feel dirty for not posting… it’s just that things keep piling up and I can’t get a handle on it. Major presentation for one of my seminars today? Yep. Have I prepared? Nope. Major paper due for my other seminar on Wednesday? Yep. Have I written it? Nope. Etc. Anyways, enough with my whining. So I love gumbo. But sometimes I don’t have enough time to make it. So here’s my answer to the spicy deliciousness of gumbo in 30 minutes flat. And actually, I have no idea if it really tastes like gumbo, it’s been a year since I had some, but this is spicy and tomatoey and okraey, so I’m happy. Saute the onion until clear (~7 minutes). Add the garlic, saute 1 more minute. Add the okra, saute for 5 minutes. Add the can of beans and tomatoes and spices. Cook for 5-6 minutes. No worries about being MIA!! Best of luck with the busyness, Jes!! Mmm, love the okra bowl. good luck with your school stuff that you have to do! i know it can be super stressful. 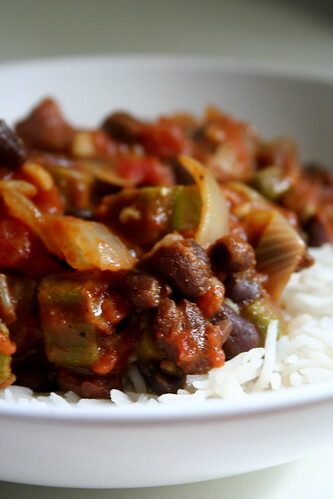 love your solution for quickie gumbo! i’m not a huge okra fan, but it looks yummy! I love okra so much, so sad that it is so very expensive over here. Your picture is so beautiful, I would love to put my fork right into it! Good luch with all your school work! Oh! I love okra–this looks fabulous. Okra makes me happy and so does your Gumbo. Your pic got me excited for Tofurkey day! Yay! I’ve actually never had okra… I’m kinda freaked out by the slimy-ness, but I would definitely try it… If only I could find it more easily! okra scares me a little. I should be ashamed, I know. spicy and tomatoey = win! and good luck with schoolwork, I don’t know why EVERYTHING has to happen within these few weeks, including halloween, but ah well… keeps things busy and interesting I guess.